This spring, we have added three new buildings to our "on-net" portfolio. These are buildings that are supplied by at least 500 Mbps dedicated bandwidth and in most cases, 1 Gbps links. 1211 Avery St is a multi-unit commercial building that also services our Avery tower site. Units in this building have access to our dedicated 500 Mbps microwave link. The condo building located at the corner of 19th St and Ford is now on-network. This building is being upgraded to a gigabit dedicated wireless link by Q1 2019. The two 6 unit condo buildings on 8th St between Washington and Cheyenne are serviced with a dedicated 1 Gbps link. For service in any of these buildings, visit our sign-up form! Yes, it's been a while. We have made some major upgrades to our network and added a bunch of new buildings. I know I need to update this with those details and will in early March - after a badly needed vacation! 1203 Washington got an equipment upgrade today. New radio link from IgniteNet and a dedicated router for the building from Mikrotik. This eliminates the shared link from Lookout Mountain and puts this building on our high-speed "on network". This building now qualifies for our Full Throttle package. 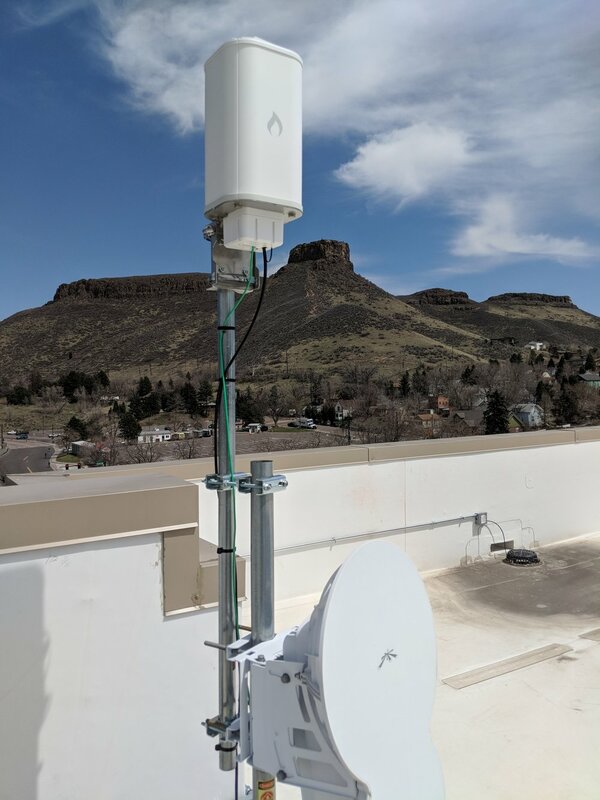 As we continue to grow our footprint in downtown Golden, we have recently brought three new residential condo buildings online with Au Wireless. Welcome 1203 Washington, Prospector Place and Miners Point - all in the downtown corridor of Golden. In each of these buildings, we have brought in gigabit microwave (fiber speeds) and then use the building wiring to service individual condo units. This allows us to provide very fast and reliable service to the units in that building. Installation times drop from around 2 hours for a home to 30 to 45 minutes for a condo unit and we can often schedule installs in the same week as you sign up because all the equipment is already on site and running. For a while, we have been big fans of the RF Elements horn antenna. On our tower, we have replaced all the sectors with horns. However, on many of our mini-pop locations, we were using smaller omni antennas. This allowed us to only have to install one radio and keep the package fairly small. On one of our mini-pops, we were having some interference issues as well as a couple subscribers that were shooting through a tree and performance was taking a hit. Couple of those subscribers were not doing so well and we were seeing a fair amount of interference issues (despite frequency selected) on the north side of town (to the right on the photo). In fact, some subscribers would not even associate with this antenna but others nearby would. So, we decided to give the horns a try here. We pulled down the omni and put up a 60 degree horn facing north and a 70 degree horn facing more south / west. Most of the subscribers are to the north. That AP kept the same frequency and power settings - just a new antenna. The 70 degree horn is on an adjacent frequency now (GPS syncronized). Here is what the radio performance looks like for the two radios. The radio with more subscribers is the north radio on the same channel and power as the omni was. Immediate improvement in signal, SNR and speeds to the subscribers. A couple subscribers that were no longer able to hit their speed package (with a TCP test) are now able to do so - just with a simple antenna replacement from omni to horn. While omni's have a place (sometimes), we are getting away from them whenever possible and sticking with an antenna design that keeps working for us no matter where we install it. We've been waiting for some time now (months) to really test out the Mimosa A5 platform. We have been waiting for the firmware that allows GPS sync. Since we run sync on all of our APs, it was not fair to test speeds on a non-synced platform vs a synced platform. Well, Mimosa released firmware 2.2.1 which allows for a 50/50 split using GPS synchronization. We've had an A5-14 up for a while with 6 clients on it as our test. All the clients are well under 300 meters from the AP - most are within 100 meters. The AP is connected to a 300 x 300 fiber line. We ran this test when there was no traffic on the AP so our test client was not competing with anyone else. Really trying to find a best case scenario. Nice clean signal, very low noise and great SNR. We have the full 8 MCS and showing 360 Mbps for PHY. Now it was time to run some real world speed tests. We wanted to see results of what a customer would see running similar speed tests. One of these results is using a speed test hosted at our ISP, the others are 3rd party. All gave back similar results. For comparison, on our ePMP APs running in 50/50 mode, we are right around 110 Mbps x 110 Mbps. The upload is a bit faster than the Mimosa but the download is a little bit slower - by around 25 Mbps on average. We normally run the ePMP in 75/25 mode but that mode is not available yet for the Mimosa platform. This is pretty close to being in line with Mimosa's claim that we should see ~250 Mbps aggregate throughput on a 40 Mhz channel with the A5. This weekend, we installed the first half of the new licensed link that will service the Easley Rd neighborhood. The larger white dish (without the logo) is the new radio. It is replacing the smaller dish with the orange "M" on it. As soon as the FCC gives us the go-ahead to turn it on, we'll start working on the far end. This will more than double our capacity into that neighborhood and will eliminate the interference we have been dealing with for the last few months. It's been a little while since we last updated our equipment. I know a number of smaller WISPs out there that have followed this. One of our goals as a co-op has been to provide as much information as possible to help others interested in this model deploy gear successfully. And, one of my motivations behind this is I like to test new gear. We have a very good working relationship with many of our vendors and as a result, get some test gear from time to time. Some of it works out great, some of it not so much, but we do deploy it all in a production environment and put it through the paces. The Easley West mini-pop is live and servicing members previously hidden by terrain and houses from the Easley East site. We have also upgraded equipment on both Easley Rd mini-pops and can now provide speeds up to 100 Mbps in the neighborhood. Those of you in the Easley Rd area, you are getting a second antenna (mini-pop) site that will hopefully be coming on-line in early October. Installation began today on the members house that will serve as the new relay - which we are calling "Easley-West". We are waiting on some additional equipment to arrive before we can turn on the mini-pop and start testing. This should double our capacity in that neighborhood and will likely serve as our last antenna site out there. We expect to be able to cover approximately 85% of the homes in that neighborhood. New capacity in North Golden! A new and high-speed "mini-pop" came on line for good last week and has it's first members on it! This is going to replace the Mountain Ridge mini-pop since it has a better view of north Golden, Mountain Ridge and parts of downtown Golden. We are going to be moving a handful of existing members in north Golden off the Lookout tower and onto this new site (called "Cliff Line") to increase speeds and reduce load from Lookout. In our initial testing, we are able to achieve download speeds in excess of 125 Mbps and upload speeds in excess of 40 Mbps from members houses that are attached to the new site. This is a big improvement from the 50 Mbps maximum we have from the Lookout Mountain site. Due to popular demand in the Mountain Ridge subdivision and area surrounding, we are adding a new repeater site. This is located just west of Mitchell Elementary and will service parts of the south half of Mountain Ridge, GoldCo Cir and area in between. We are working on a roof rights agreement to add an additional site in the Mesa Meadows subdivision to hopefully complete our coverage on the north side of town. AU Wireless provided free Internet to the Golden High School football teams fundraising tent at Buffalo Bill Days in Golden this past weekend. We were contacted by a future member of the co-op who asked if it would be possible to help out the football team and provide Internet to allow the tent to have a couple point of sale computers for people to buy merchandise online and support the team. Since our main Internet connection is in the American Mountaineering Center right across the street, we asked the AMC for permission and they happily allowed it! Please thank the AMC and Colorado Mountaineering Center when you next visit for helping support AU Wireless and local fundraising in Golden! We've made a couple changes to the equipment we have deployed and I know some other co-ops out there have been following this so let me detail the changes and why. Today we brought our brand new "mini tower" on-line in Harmony Village. Due to increasing demand (and a bunch of big cottonwood trees), we decided Harmony Village needed its own transmitter. With the help of Micah, one of our members, this transmitter is ready to go and has its first member on it! 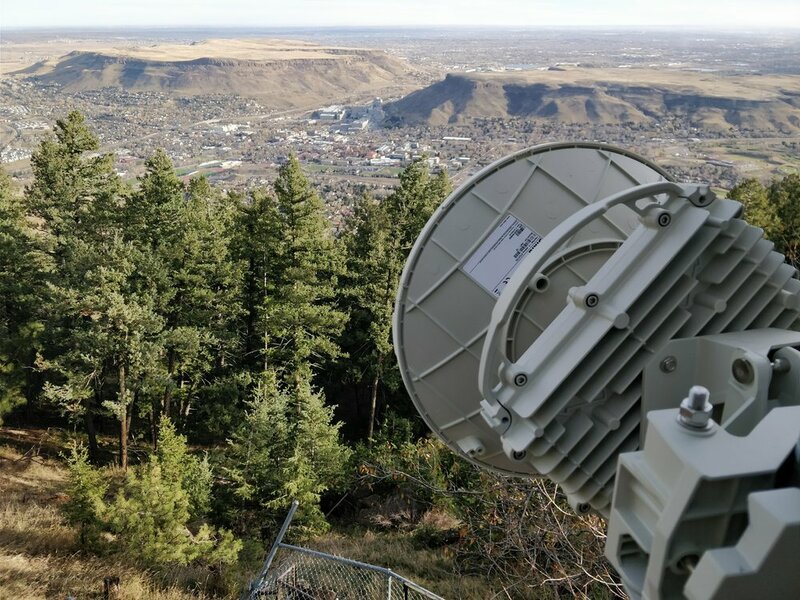 Bringing the transmitter local (vs the top of Lookout Mountain) reduces congestion on the three transmitters on Lookout and speeds up the connections to the individual member homes. It also potentially allows more homes to see the local transmitter. We have plans for this type of deployment in the Easley Rd area, in the Mountain Ridge subdivision and downtown Golden. Harmony Village is a perfect location for our first mini tower and we welcome the residents to the network! Equipment provided by AU Wireless helped provide Internet access in the middle of the Nevada desert. The Further Future festival took place April 29 through May 1, 2016 in the desert outside of las Vegas, NV. YDIM - a company that has been providing networking services to large music festivals for many years used equipment from AU Wireless inventory to bring 300 Mbps of Internet connectivity to the festival.